Bingo. If you look close at the last line you’ll see a JMP instruction instead of a CALL. 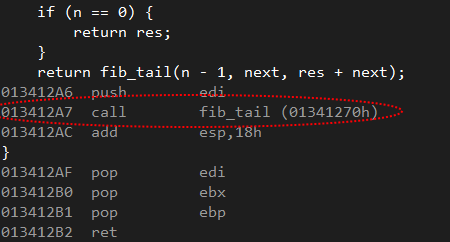 In this case tail recursion is enabled, our Fibonacci function doesn’t suffer from any stackoverflow exception because at assembly level it is simply translated into an iterative function. And now surprisingly we have tail recursion enabled again!! With the aid of 64 bit registers (rax, r8, rcx, rdx) the caller and the callee share the same stack frame and the callee returns directly to the caller’s caller. I posted a question too on StackOverflow and it seems it could be a problem with the Microsoft C++ compiler. One of the answer on Stackoverflow states that other C++ compilers like clang don’t suffer from this problem but I have to test it. I put the solution example on GitHub, you can clone it and try yourself. I was told on Reddit and Stackoverflow as well that VS2013 Community Edition does not have this issue. I tried with VS2013 Ultimate but I noticed the same exact problem. I will try in the next few days to test GCC and compare the result. See the Example project on GitHub. I hope this can save you time when and if you need to see why tail recursion might have not been correctly handled by the compiler. 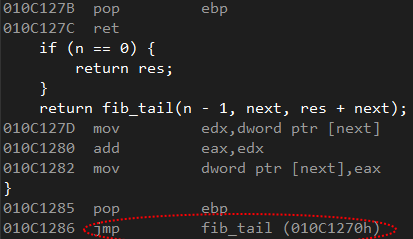 since when there is a tail recursion in C++? can we have co-routines now? I think it’s a compiler optimization that has always been there since C. I have to check about GCC but it seems it doesn’t have that problem. I will try it very soon! Why accumulate in a 64-bit variable and return an int? Tail recursion might be getting disabled because the final call has to coerce the result to 32 bits. Right observation. It’s a typo, I will fix it, thanks. if you look at the implementation (on GitHub follow the link below), the return for the function fib_tail is a ULONG64 as well. Hi, it seems to be a bug in MSVC optimizer, you should file a bug report about this at http://connect.microsoft.com/visualstudio.